Switch back and forth between reading the Kindle book and listening to the Audible narration. Add narration for a reduced price of $13.99 after you buy the Kindle book. 5.0 out of 5 starsEntertaining. Clever. Informative. A 'true' sci-fi. After reading this book, one would hope that that the genetic manipulation of the human genome would be closely supervised. Mr Kunsken has several genetically manipulated branches of humanity interacting in his novel. There are normal people; "Puppets" - diminutive people who hold in reverence those who omit a certain odour; "Mongrels" who can only survive at great ocean depths where pressures are several hundred atmospheres; homo quantum who are able to observe the quantum state (of 11 dimension). Each branch has difficulties, social customs, desires and interact when necessary. This story is really about a "con" being perpetrated to obtain a newly discovered, backward in time (11 years), coupled wormhole device. 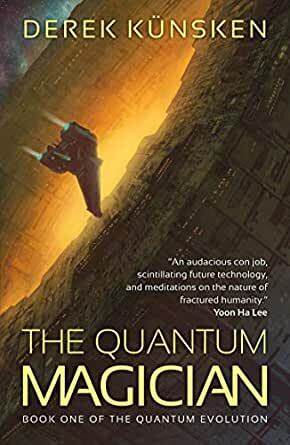 I've not read a sci-fi novel quite like this one with its genetic manipulations, different social interactions necessary to live as one of the races, the "con" itself. Some of the language may turn a few potential readers off but I think the book is entertaining, clever and informative, a true sci-fi, and so I highly recommend it. I am an avid reader and have not left any reviews ever but this book compelled me to spread the word. This was such a deliciously simple story and yet there are so many complexities within it but the author has done an incredible job in intertwining them all into an incredible finished product. Derek is an amazingly talented author and I cannot wait for the next installment in the series.......please let there be a series. Mind blowing adventure, unexpected plot twists to keep you enthralled along with ‘head hurting’ science that pulls you in deep. Suspenseful, wonderful enjoyment right to the very end. 5.0 out of 5 starsOriginal, fast paced sci fb. Loved it. Suchh a relief to read intelligent sci fi action. A heist embedded in a imaginative universe complete with alt theologies and cultures.